Launceston Place Names | Launceston Then! It is always intriguing to know how certain places found their name. Sometimes the position and the geography play a strong role, whilst the surname of a resident can also lend their name to a place, such as Ching’s Alley or Page’s Cross (Tesco) which it’s believed derived its name from a certain 14th century gentleman, Henry Page. Some place’s began their life known as something completely different to what they have become known as today. Angel Hill for instance was once known as Sibardiswyll Hill and it is due to the choristers of St. Mary’s that it is no longer known by that name. A visiting Bishop who had fallen asleep in his carriage was awoken as he came up the steep hill by the heavenly singing of the choir who had formed to greet him, and exclaimed in his sedentary state that ‘it was as if he could hear the sound of angels as he ascended to heaven’. From that moment on Sibardiswyll Hill was known as Angel Hill! That’s not to say that the name of Sibardiswyll has disappeared completely as it still lives on today in it’s alloyed version as Cypress Well (The poet, Charles Causley, being the famous resident at No. 2, Cypress Well). Other places have derived their name from fondly remembered businesses or people, Treleaven’s Corner possibly being one of most popular and this adopt’s it’s name from the much loved outfitters that dawned on the corner of Broad Street as it passes into Southgate Street for over a century until its closure in the 1980’s. 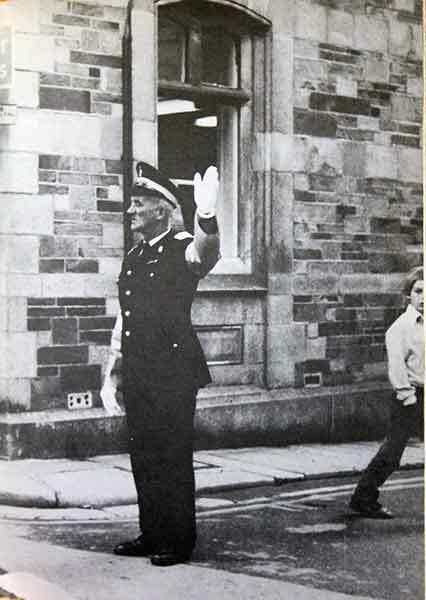 Interestingly this corner was also known as Sandercock’s Corner due to the presence for several decades of the traffic Warden Tommy Sandercock (below left) who stood guardian of the traffic as it passed through the Southgate. Most of the younger generation will know this now as the Halifax Corner after the bank that now sits in the building that was once Treleavens. The town centre also holds Lennards Corner (above right) which is the corner of Broad Street as it rises up into the square. 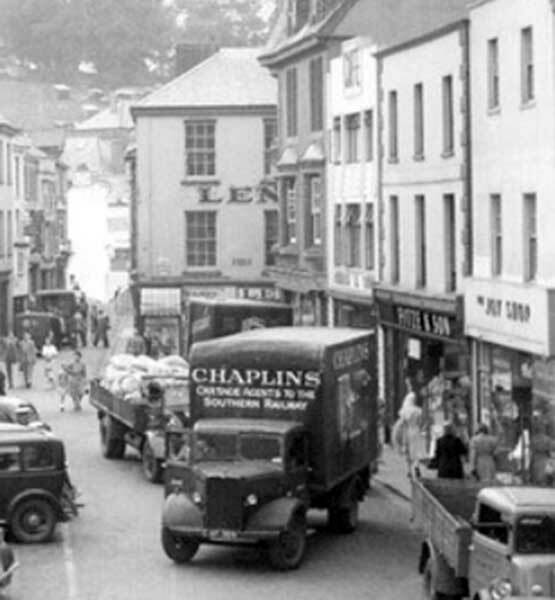 This was named as such due to the Lennards shoe shop that resided in the building on the right as you enter the square and is now the Santander Bank. But before the arrival of Lennards it was known simply as Star Cross after the road layout. The other side of the Square, the junction of Broad Street and High Street was once known as Kneebone’s Corner after the Kneebone family that ran the shop there for several generations. At the junction of High Street and Church Street there is a small alleyway leading up into Castle Dyke, this was once known as Castle Dyke Crack, but it is now known as Samford Timewells Lane(left) after the buff breeches, gaiter and overall maker, Samford Timewell, who held a shop there in the early 19th century. Just along Southgate Street we have Ching’s Alley which was named after a prominent Launceston Family held premises for the chemist business there during the nineteenth century. As you exit under the Southgate you are faced with Race Hill. It is believed that it’s name was derived from some sort of races that were held along this piece of road. There is some conjecture that it was a place that actual races were held and some have suggested that it may be attributed to perhaps a water race. What we do know for certain is that it was originally called Whyte Lane and it received the change in the later part of the nineteenth century. At the foot of Race Hill we have Exeter Street which was cut in the early nineteenth century as was originally called the New Eastern Road. As Exeter Street joins Tavistock Road we have what is known as Dockacre Road joining from the left. Kensey Place which is the first set of buildings to the right as you enter Dockacre Road, was the original Workhouse and lent its name to this part of the road to its junction with the base of Angel Hill and Ridgegrove Hill. The balance of Dockacre Road, which derives its name from the grand old house at the aforementioned junction, was until the 1960’s known as Horse Lane. Other place names that are now extinct are Noah’s Ark and Clampitt’s Road with the former now being part of the Multi-Storey Car Park in Westgate Street. It was known as Noah’s Ark due to the fact that with a series of Tenements along its boundaries, the land in the centre was used as a stock holding for a variety of animals. Clampitt’s Road was the short piece of road that ran along from Clampitt’s House to the entrance of Launceston College. It is now part of the A30. Other roads that have changed their names over the time are Bodmin Road (Western Road) King William Road (New Road or St. Thomas Road) and Zulu Road (Roydon Road).